This book is part of a three-book series. Ned Mohan has been a leader in EES education and research for decades, as author of the best-selling text/reference Power Electronics. 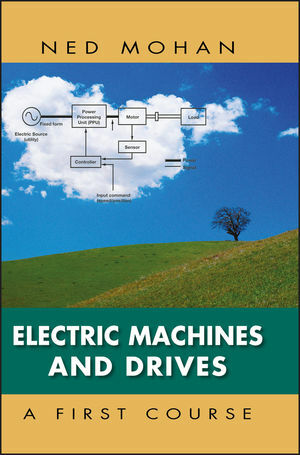 A unique way to describe induction machines that clearly shows how they go from the motoring-mode to the generating-mode, for example in wind and electric vehicle applications, and how they ought to be controlled for the most efficient operation. Ned Mohan is Oscar A. Schott Professor of Power Electronics in the Department of Electrical Engineering at the University of Minnesota, where he has been teaching for 33 years. He has written five textbooks; one of them is translated into several languages. He has 13 patents and has written over 200 technical articles. He is actively involved in the area of renewable energy and is working on the next generation of wind generators and storage. He received the Distinguished Teaching Award by the Institute of Technology at the University of Minnesota. He is a Morse-Alumni Distinguished Teaching Professor and is a member of the Academy of Distinguished Teachers at the University of Minnesota. He received the Outstanding Educator Award from the Power Engineering Society of the IEEE in 2008. He is a Fellow of the IEEE.